Hello again and a big welcome to any new visitors. It's day one of a new Crafty Boots challenge. The theme for this challenge is 'Things with Wings'. It was quite hard deciding how I wanted to interpret this topic, in the end I decided on a counted cross stitch angel, I hope you like her. 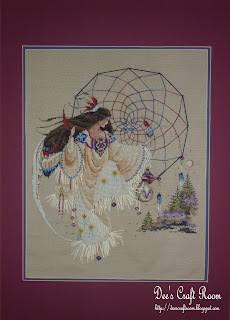 I find myself distracted by the beadwork and dreamcatchers net and almost miss her wings, but they are there if you look. 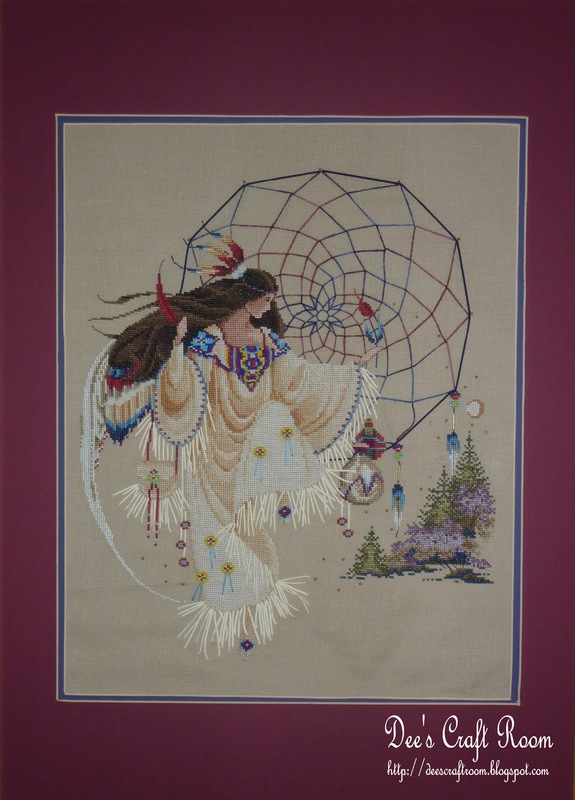 This is a Butternut Road pattern by Marilyn Leavitt-Imblum entitled "Earthdancer". Oh my!!! This is absolutely, positively STUNNING!!! I cannot take my eyes off of this beauty!!! 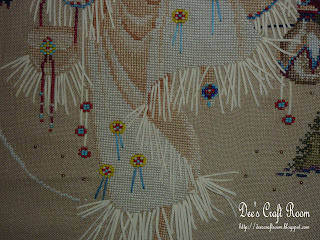 My father was part Cherokee and Sioux, so Native American creations truly touch my heart! What can I say...I LOVE THIS...every gorgeous detail!!! How can we get pattern? It's stunning!!! May ask you, what fabric have you used? Thank you for your lovely comment Lina. I made this quite some time ago now and I cannot remember which fabric I used. I remember that it was a 32 count linen. It was most likely Cashel or perhaps Belfast linen. I hope this helps. This is beautiful! Thank you for posting pictures with details up close. I especially love those suede ribbon/thread touches! First time I see it in a design, looks so very nice. Thank you Olga, it is so kind of you to leave such kind words. It took a long time to finish this canvass but it was really worth it and it is among my greatest treasures. Although I made it a long time ago I discovered that you can still purchase the chart from ebay for around £10.00. If you do decide to stitch this chart it would be worth while tracking down the embellishment kit with the suede ribbons and wool. I bought this pattern 13 years ago, did all the cross stitch then couldn't find the beads and it's been left in a drawer ever since! 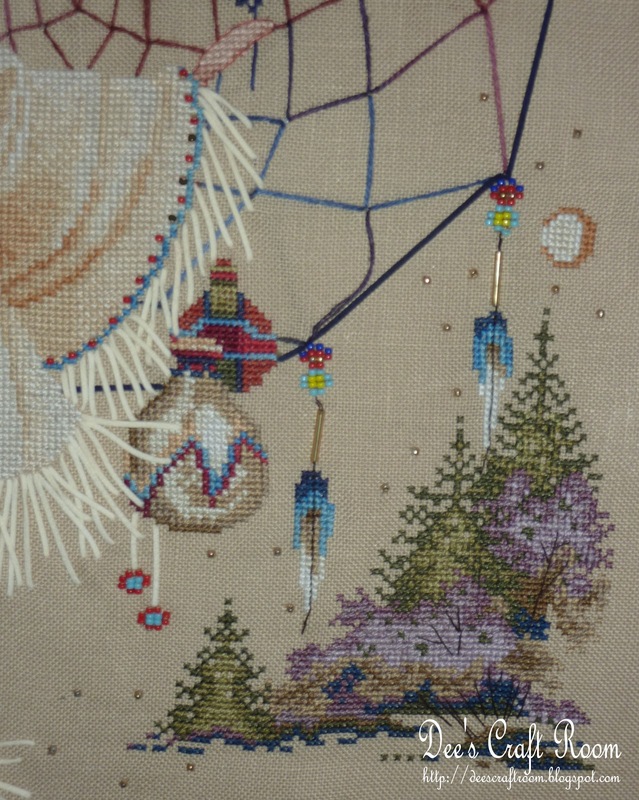 I'm picking it back up to try and finish it off over the winter and I'm looking online for the rainbow gallery threads and Mill Hill beads. I've noticed that Mill Hill have a lot of different types of beads - can you remember what bead type you used? Wow, like you, I made this a long time ago and it is hard to remember. I do remember a few things about the beads, I bought the bead packs listed on the pattern (seed beads, bugle beads etc. I think they were Mill Hill 00557, 02059, 02063, 02064, 02065, 02068, 03017, 92011) and I only bought 'Mill Hill' brand but, even so, where there are a lot of beads stitched together, they were a little large for the material - I used 32 count. 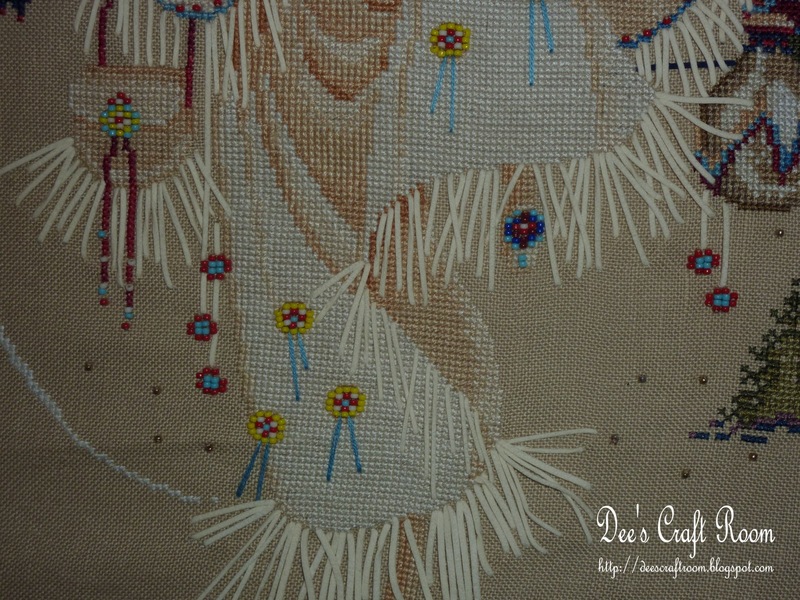 In those places the beads just would not lay well, in the end I had to adjust the design slightly to make them fit. I had trouble buying the wool and ultra suede strips. In the end I tracked down a pack containing all of them, but it was well worth the effort. Good luck with finishing your design. I hope you get it framed and it gives you as much pleasure as mine gives me when I look at it. I to bought this pattern many years ago. Now that I finally had eye surgery I am able to continue my sewing. 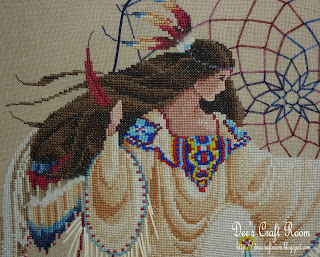 I found that my pattern is worn away across one line just below the blue circle on her right arm. Because its been folded all this time. Is there anyone who is able to help me with this problem. I would hate to have to purchase a new pattern just for this one line. Any help would be appreciated.